Made from 100% cationic polyester, our performance-wear apparel is the ideal clothing for just about any outdoor activity! This Born of Water Women's Jellyfish Tri-Blend Tank Top is designed with comfort and style in mind. Dive, surf, paddle, or fish, the Born of Water logo represents the lifestyle we know and love! Our Solar Neck Gaiter is a multifunctional performance accessory that can be worn at least nine different ways. While we all dream of the warm, sunny tropics, with palms swaying overhead, divers aren't afraid of a little chill! 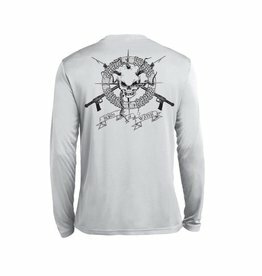 Our Diver Days shirt is super soft, but durable for your diving lifestyle.